While researching new things to do for a weekend family getaway to San Francisco, I focused on finding things we have never done before as a family and things that were off the beaten path and not considered “touristy.” So when I found the Giant Camera Obscura, the historic Sutro Baths ruins, and a hidden labyrinth all in San Francisco’s Lands End area, I was beyond excited! Plus, the Lands End Lookout is just up Point Lobos Avenue from Golden Gate Park and we had already planned to visit the California Academy of Sciences. It so was perfect! I knew the labyrinth would be amazing and I didn’t want to spoil the surprise and delight for the rest of the family, so I told them it existed, but I didn’t show them any photos. A a secret labyrinth in San Francisco? Hiking trails in San Francisco? I don’t think Brian quite believed me, but he went along with my plans anyway. We arrived at the Lands End Lookout in the morning, found a parking spot right near the Coastal Trail Trailhead, and decided to first check out the Camera Obscura behind the Cliff House and then walk down the hill to explore the old Sutro Baths ruins. By the time we were done traversing the bathhouse ruins, it was lunch time and we were starving! Thankfully we had a picnic lunch packed and ready to go, so we tailgated for lunch, enjoying the overcast views of the park and the ocean. When we were done with lunch, we hit the Coastal Trail for the trek out to Eagle’s Point and the Lands End Labyrinth. The trail used to be an old railroad bed, so it is wide and flat until it reaches Mile Rock Beach. As we walked, we were rewarded with scenic vistas of the Marin Headlands and spectacular views of the Golden gate Bridge. Eagle’s Point is just past Mile Rock Beach, so we decided to first go check out the labyrinth and then loop back to check out the beach on the way back. When we first walked out to Eagle’s Point, I didn’t see a labyrinth. Was I fooled? Was the information old? Was the hidden labyrinth gone? Nope! It wasn’t until we climbed to the very top of the point and looked down did we see the huge stone labyrinth laid out below us. It was magnificent. I sent the kids down first to walk it, so I could snap a few photos of them in the labyrinth. I then followed them down for some photos with the Golden Gate Bridge in the background. The location, on the very edge of Eagle’s Point in Lands End is truly awesome. Standing in the wind, looking out over the water, the labyrinth brings an air of peacefulness and spirituality to the area. I am so glad we found this hidden San Francisco gem! The kids loved it so much that when I found another secret labyrinth in San Francisco, The Bernal Hill Labyrinth, we made plans to hike Bernal Hill and visit the Bernal Hill Labyrinth too! Brian and the kids walking to a lookout at Eagle’s Point on the Coastal Trail in San Francisco’s Lands End area. They are above the hidden labyrinth, enjoying views of Mile Rock Beach and the Golden Gate Bridge. Perched on a flat ledge hanging over the Pacific Ocean, a hidden labyrinth sits at the tip of Eagle’s Point on the California Coastal Trail in San Francisco’s Lands End area. Created by local artist Eduardo Agilera on the Vernal Equinox in 2004, with rocks from the surrounding area, it is now known as the Lands End Labyrinth. Over the years, the work of art has been destroyed and rebuilt many times, but this year the vandals have been relentless. Yerge rebuilt the labyrinth in January and April, carrying hundreds of pounds of rocks in a traveling backpack from Mile Rock Beach. The damage is far worse this time. The first time Yerge was confronted by vandalism in 2011 she was devastated, but she has since learned to accept the damage. Today the Lands End Labyrinth endures as a symbol of wholeness and a representation of the purposeful path of life. Unlike a maze, a labyrinth, with roots in Eastern and Western religions, has one singular path. While it twists and turns, there are no choices to be made, just one path leading to the center and back out again. For visitors, it is a tool for self-assessment, meditation, and reflection. From it’s position overlooking the Golden Gate Bridge, visitors can enjoy peaceful solitude, even among the other tourists, hikers, and visitors. 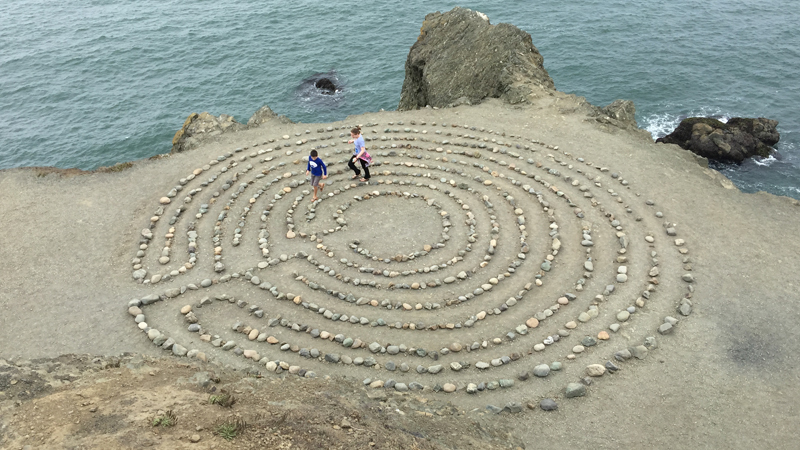 In the area surrounding the labyrinth on Eagle’s Point, there is a quiet air of understanding and mutual respect as people walk the labyrinth, stare at it in wonder, listen to the waves methodically crash against the rocks below, and enjoy the sweeping views of the Marin Headlands. The Lands End Labyrinth is truly one of San Francisco’s best kept secrets. Lands End is a park in San Francisco within the Golden Gate National Recreation Area. It is a rocky and windswept shoreline at the mouth of the Golden Gate, situated between the Sutro District and Lincoln Park and abutting Fort Miley Military Reservation. The park contains the ruins of the Sutro Baths, several shipwrecks visible at low tide, and a memorial to the USS San Francisco. Numerous hiking trails follow former railbeds along the cliffs and down to the shore. The most-traveled trail in Lands End is the Coastal Trail, a section of the California Coastal Trail that follows the railbed of the old Cliff House Railway. This trail offers one of the best views in San Francisco. It is handicap-accessible until the Mile Rock Overlook, and bike accessible until the Eagles Point steps. A spur trail takes users to Mile Rock Point and Mile Rock Beach, which offer views of the Golden Gate Bridge. The Lands End Lookout, a Visitor Center that houses historical displays, a cafe, a gift shop, and restrooms, opened on April 28, 2012. On a cold day, a hot cocoa or hot cup of coffee is perfect for your walk to the Sutro Baths ruins or the hidden labyrinth! The Lands End Lookout is located at 680 Point Lobos Avenue, San Francisco, CA 94121 next to the Cliff House. It houses a Visitor Center, cafe, gift shop, and restrooms, and is open daily from 9:00 am to 5:00 pm. The Lookout has a large parking lot where 48th Avenue meets Point Lobos Avenue, but it fills up fast because it is the best place to park when visiting the Sutro Bath ruins, the Cliff House, and the Camera Obscura, as well as hiking the Coastal Trail. Arrive in the morning to secure you parking spot, or you can try to find a parking spot on the street or in the small lot across the street. If you only want to visit Mile Rock Beach and/or the hidden labyrinth, you can also park behind the Legion of Honor and walk in that way. Pack a picnic and plan extra time for your kids to run around! The Coastal Trail is stunning and there are a ton of fantastic spots to enjoy a picnic and take in the outstanding view. Stop at Mile Rock Beach for an open area where kids can run around and burn off extra energy! Wear layers because it’s really windy out at Eagle’s Point, and don’t wear floppy hats or hats with brims, as they may get blown off. Trust me, you don’t want to get stuck carrying your hat all day. While we went up and around to reach the labyrinth, you can go an alternate way! Follow the Coastal Trail until you reach the spur trail to Mile Rock Beach. Walk down the steps, and where the staircase turns a hard left, keep going straight on the trail. It will take you right to the labyrinth.